In mid-May I was privileged to be a part of a truly and literally monumental project: the Digital Preservation of Mount Rushmore. CyArk partnered with the Scottish Centre for Digital Documentation and Visualisation (CDDV), US National Park Service (NPS), and several local organizations (Wyss and Associates, RESPEC Engineering, and the South Dakota School of Mines and Engineering) to bring state-of-the-art survey and documentation techniques to this American Icon. 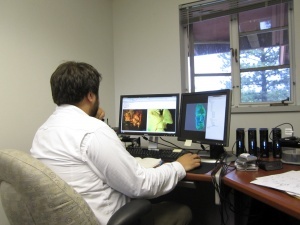 The data capture is the first phase of a five-year project between CyArk and the NPS to provide both engineering-grade data for tasks such as rock-block monitoring, analysis, and site resource management as well as a base data set to create virtual tourism and educational materials for public outreach and data dissemination. The project had several hurdles to overcome regarding data management. 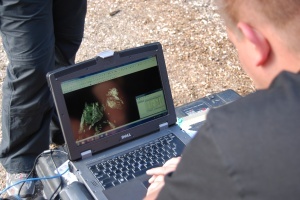 Never before had CyArk worked with up to three teams operating five scanners at once, let alone in various locations in the park and on the mountain. The complete coverage of the intricate faces was a necessity for the engineering needs of the park and it was critical that no stone (or in this case eye or nose) be left unscanned. In addition to the scanning complexities, we worked within strict data security protocols, as many sensitive, off-limit areas were being documented as part of the project. To achieve the daunting task, we setup a data command center in the Administration building on site, and all team members were equipped with two-way radio systems. I remained in an office with two monitors, a robust computer system, and over 10 terabytes (that’s 1 million megabytes!) of hard drive space for the data and its multiple redundant backups. As the teams scanned, I’d be registering the previous day’s data set, creating an ever-up-to-date compilation of the project’s work. This allowed the scan-team members on the mountain or on the visitor’s trail to radio the command center for up-to-date information on the scans. With a mouse in one hand and radio in another, I could provide instant feedback on scanner setup locations and where data was still needed to ensure optimal and complete coverage. This on-going live feedback was a thrilling experiences for the documentation team, as well as the many tourists whom I later learned were huddled around team members scanning in the visitor areas with their radios turned on. It allowed us to coordinate an unprecedented level of complex logistics and I think the tourists liked being able to hear the live exchange as they watched the teams dangling from the mountain side. The task at hand was large--billions of data points representing a millimetrically accurate model of the mountain and park were being collected. The Leica scanners used consisted of four different manufacture models: the ScanStation 2, the HDS6000, the HDS6100, and the new ScanStation C10. Each employs its own data format, requiring a multitude of notes and computer folders to keep track of daily scans from different machines. Each scanner model was strategically placed within the site to utilize its own strengths; for example the ScanStation 2 with its robust long-range capabilities was used along the base of the mountain. The 6000 and 6100, with their unsurpassed speed for very dense data capture, were used to capture all of the nooks and outcroppings in the canyon, the 6100 was mounted on the CyArk Rig to capture all of the facial details of the sculpture, and the 6000 was used to for the park grounds. And the impressive C10 was the workhorse atop the mountain for wide-view scans of the sculpture because of its blend of range and speed. Not only did data have to be reviewed by law enforcement for segregation into public data and secure park data, but any team members accessing the mountain top had to pass a full government background investigation. I'm happy to say we all passed. Security at a national monument is no joke. Complete coverage of the mountain was a necessity for the carved faces, data security was essential for the monuments long-term safety, and an international team of experts had to rely on one another to get the job done in limited windows of time due to unpredictable weather conditions (check out the snow below). I'm proud to say we did the job, and we did it well. So far it has been a unique experience of logistical challenges, but I know as we strive towards the CyArk 500, this will be a stepping stone--and one picturesque training scenario--to accomplish any job we're faced with in the future. 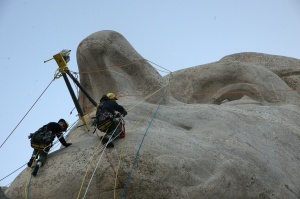 The Mount Rushmore National Memorial Ropes Team dangles over the mountain face with the specially designed CyArk Rig, which held a laser scanner just meters from the surface of the stone for capturing all the nooks and crannies in high-detail. Photo by Doug Pritchard of CDDV. Me feeling very at home in the temporary command center, registering daily scans together to provide live feedback on progess and completeness of data capture. Photo by Liz Lee of CyArk. Al Rawlinson of the CDDV works in the field with the scanning equipment to capture the mountain facade. Photo by Chris McGregor of CDDV.